**Our Ultimate Outsider stamp can be found at the admission desk in the Visitor Center. Charles Towne Landing State Historic Site sits on a marshy point, located off the Ashley River, where a group of English settlers landed in 1670 and established what would become the birthplace of the Carolina colony. Charles Towne Landing introduces visitors to the earliest colonial history of Charleston. Interact with hands-on exhibits in the Visitor Center, talk to knowledgeable staff members, and take an audio tour on the self-guided history trail. Guests can step aboard and tour the Adventure, Charleston's only 17th-century replica sailing ship, see cannons fired, or take a peek at otters, bears, bison and more at the Animal Forest natural habitat zoo. The grounds also include 80 acres of gardens, with an elegant live oak alley and the Legare Waring House. One of Charleston’s favorite sites for weddings and other special gatherings, the Legare Waring House combines historic charm with unique and flexible space—come see it for yourself! 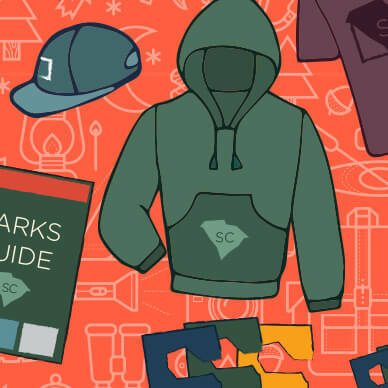 Don't forget to check out the other parks in the South Carolina State Parks system. Experience the charm of Colonial South Carolina or consider a hike to the stunning Raven Cliff Falls at Caesars Head State Park!